As mentioned on Monday, the researchers at the Su lab have been working diligently on a paper to introduce their new computational framework for reproducible multi-omics data analysis. Advancements in sequencing technologies have made sequencing cheaper and more efficient, but this means that researchers need a way to handle all that data. Different groups have generated a variety of tools for analyzing disparate datasets, but pipelines that integrate these different tools can be daunting to use without a computational background, or may be unaffordable due to commercial licensing fees. And that’s where Omics Pipe comes in. Its framework is modular and open source so its functionality can be extended by the research community; it already supports several pipelines; it has built in version control; and best of all, it’s free! Check out the preprint article; to learn more about Omics Pipe, or visit the Omics Pipe repository. 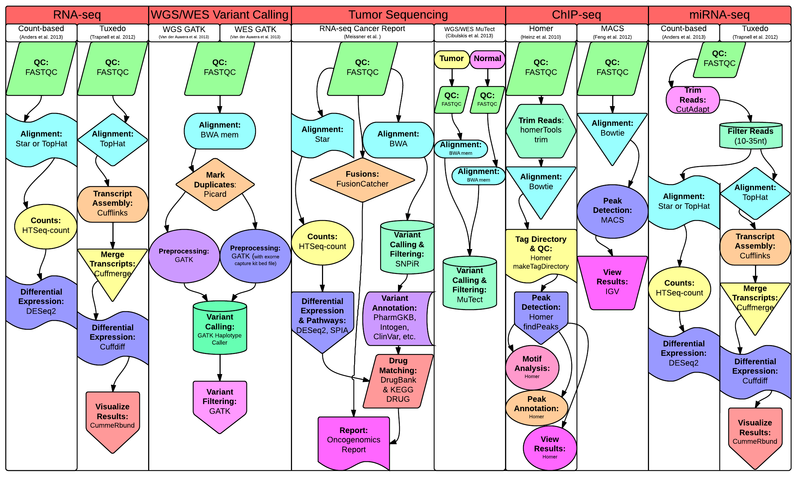 Here are just some example pipelines of tools that Omics Pipe can automate. Try it out for yourself!